Every 99 Day Calendar you purchase† provides one entry in all the future draws in this sweepstakes. You could win† cash every hour, daily prizes of $2,000 Transat travel vouchers, and weekly prizes of $10,000 CASH! You can enter this sweepstakes until March 24, 2017, with winnings happening for every day from April 14 to July 21, 2017. Calendars start at $30✦ each. Plus, the multi-packs make it easy to offer calendars as gifts to friends and family! 3-packs are $60✦, or get 10 for $100✦, 25 for $190✦ or 40 for $250✦. As a special thank you, with every purchase of 10 calendars or more, you will receive a gift with purchase, while quantities last. PLUS, you get 3 entries in the $1 MILLION‡ ONLINE Balloon Race! Don’t forget the popular SUPER CALENDAR**. It’s a different sweepstakes where you could win $10,000 EVERY DAY IN MAY. Super Calendars start at $10✦ and you can purchase** 10 for $50✦. **No purchase necessary. ✦Plus applicable taxes. Open to legal residents of Canada (excluding Quebec) over the age of majority. Entry January 23, 2017 – March 24, 2017. Thirty-one (31) prizes, each consisting of $10,000 cheque payable to the winner. Math skill test required. Odds depend on number of entries received. Rules: www.99daysweepstakes.ca/supermay/officialrules. Bank note images used with the permission of the Bank of Canada. ‡/†/*No purchase necessary. ✦Plus applicable taxes. Math skill test required. Open until March 24/17 to legal residents of Canada (excluding Quebec) over age of majority. †Odds for most prizes depend on number of entries. 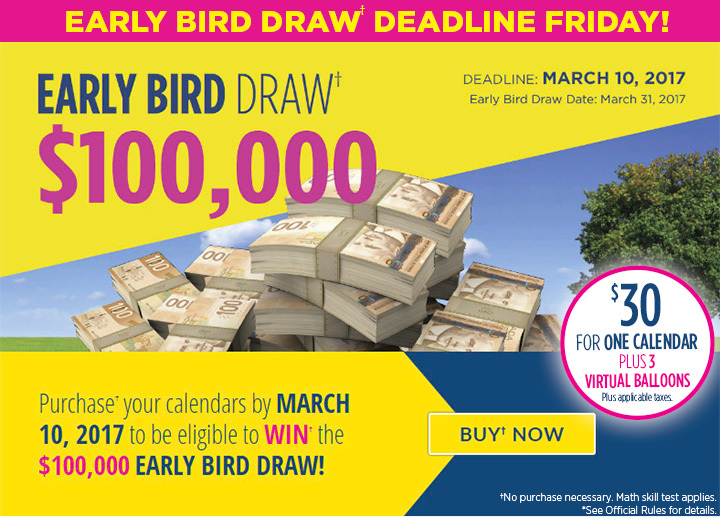 1 VIP Prize (Deadline February 10, 2017): $25,000; 1 Early Bird Prize (Deadline March 10, 2017): $100,000. Entry deadline for all other prizes March 24, 2017. 2,376 Hourly Prizes: $100; 99 Daily Prizes: $2,000 Transat travel voucher; 14 Weekly Prizes: $10,000. ‡The odds of winning the Balloon Race depend on the number of eligible balloons and the specific attributes selected for each balloon. The 1 winner of the race will be awarded the pre-established prize value associated with a ball drawn by Deloitte LLP of either $1 Million or $100,000. Odds of the Balloon Race winner winning $1 Million are 1:350. See full rules at: www.99daysweepstakes.ca/rules. Heads up! The 2017 Princess Margaret Cancer Centre Home Lottery is already 50% sold out!